I made this stew on New Year’s Day. I can’t think of many things as warming and comforting as a big bowl of slow cooked food. My beef stew with horseradish dumplings was made up of almost everything I had leftover in my fridge and cupboards; happily simmered away with some beef shin. A delicious, make-the-most-of-everything, homely stew for four people. Trust me on the ingredients; one or two may sound a little out of place but they really add to the dish. Start by putting the flour into a bowl with a good sprinkle of salt and pepper. Mix the beef into the flour so it is all coated. Get a casserole dish onto a medium-high heat on the hob. Add a little oil and fry the beef until browned. Remove and set aside. 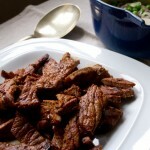 You will need to fry the beef in two batches so that it fries properly. Add a little more oil to the pan and tip in the onions, carrots and mushrooms. Leave to soften for 10-15 minutes, scraping up any sticky bits from the bottom of the pan. Tip the beef back into the pan with the tomatoes and olives then pour over the beer and beef stock. Bring to a boil. Once the pan has boiled put the stew into an oven at 160C for two hours. After an hour and a half make the dumplings. Rub the flour and suet together to make a breadcrumb texture. Add the salt, thyme and horseradish and mix together then add drops of water, a little at a time, to bring the mix together to form a dough. Divide the dough into eight pieces. Get the stew out of the oven and pop the dumplings on top then return everything to the oven for the last twenty minutes. I like to add tomatoes to stews I make as it gives a lovely sweetness to the whole dish. 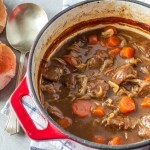 Onions, carrots and mushrooms are a classic backbone for any stew and after two hours the beef really is melt in the mouth. Adding a handful of olives gives a fantastic savoury twang and the beer and beef stock gravy that is created is nothing short of delicious. Top that off with a faint note of horseradish and fresh, earthy thyme. Just the ticket. Oh, and if you make the full amount but there’s only two of you it makes brilliant keptovers topped with a cloud of mashed potato and baked. Those horseradish dumplings have to really add to the flavor of your meal…delicious. Hi Caroline, this stew looks delicious, love that you added olives. I bet they added a wonderful flavor. Happy New Year! What a comfy and delicious looking dish, Caroline. Happy New Year to you. Okay – horseradish dumplings make me happy for sure. 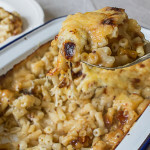 I love this beefy dish, it looks perfectly comforting for this cold winter evenings. Horseradish dumplings? Love the idea! Very creative. Great looking stew, too — super way to great the new year. Speaking of which, Happy New Year! Great time of the year for stew and wow I so want to try these horseradish dumplings! Comfort food at its best – love slow cooked meat and I am a big fan of horseradish, a wonderful combination! You can’t beat a good stew on a cold day and I just love the combination of horseradish and beef! Delicious! Not a thing in there sounds out of place to me! What wonderful comfort food! We made several stews while we were in the U.K. – chilly and damp, as you know! Wish I had this recipe when I was cooking! Happy New Year, Caroline, and thanks for your suggestions. We loved Betty’s (yikes, did I already tell you this?) and several of your other recommendations! I completely forgot that you had published this! Planning to make this weekend! Lucky you! I hope you enjoy it! ahhhh this looks so delicious. And the idea of adding horseradish dumplings is pure perfection! Oh dear lord yes, delivery of this please. looks so good, reminds me of my mums cooking don’t think I can get suet here.